Price €120 ( early bird €100 before April 15th). Booking is essential as places are limited. Contact [email protected] to book. These four sessions exploring artists and experimental filmmaking are designed to immerse and inspire both experienced artists/filmmakers and beginners alike. Established practitioners Le Cain and Desmond will present contrasting perspectives and insights on each theme to stimulate a discursive mood of creative investigation. Students/peers/participants are expected to be actively engaged through sharing examples of their own work and research. This sharing will build towards the final session where everyone participates in a kaleidoscopic improvised expanded cinema style 'Filmjam'. This short and intense course is designed to both challenge and excite with a combination of critical investigation and playfulness. MATERIALIST FILM: What is film without subject, without image? How does the structure of a film become the content? How is meaning constructed without narrative? These are some of the questions explored in this introductory session. FICTIONAL DOCUMENTARY: Crossovers between the real and unreal, the fictional and documentary - in these in-between spaces, facts, truth and the imaginary blur and collide to create new meanings and insights. PERFORMANCE AND FILM CROSSOVERS: An exploration of body and performance in film between live art, dance, theatre, ritual and cinema. The filmmaker as performer and/or as director. The film acting as documentation and/or as construct. 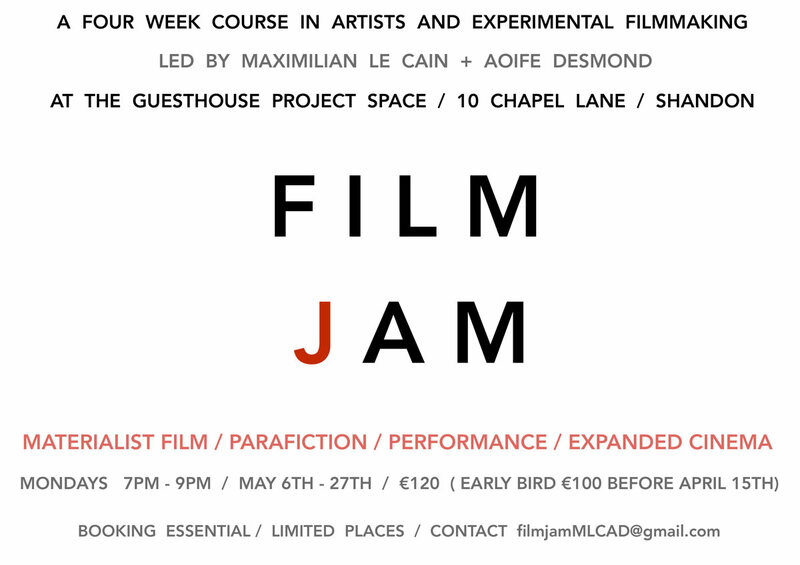 FILMJAM/EXPANDED CINEMA: The group will create a live experience of film, sound and performance using found and fabricated material. Ideas and examples from expanded cinema will be introduced as precedent and provocation. Maximilian Le Cain is a Cork-based experimental filmmaker and writer. He often makes films with Vicky Langan and is affiliated with Experimental Film Society. Aoife Desmond is an interdisciplinary artist who works with film, performance and other media. She also writes, lectures, curates and works collaboratively.